Wilmcote Lock No 48 Narrows is a minor waterways place minor waterways place place on the waterways major waterways place village town city on the Stratford Canal (South Section) between Featherbed Bridge No 59 (Wilmcote village on east bank) (1 mile and 2¼ furlongs and 8 locks to the northwest) and Winding Hole above Stratford Top Lock No 52 (1 mile and 5¾ furlongs and 4 locks to the east). 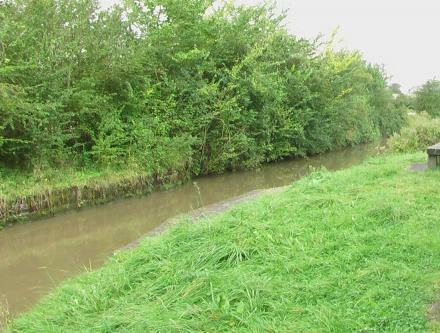 The nearest place in the direction of Featherbed Bridge No 59 is Wilmcote Lock No 47; 1 furlong away. The nearest place in the direction of Winding Hole above Stratford Top Lock No 52 is Wilmcote Lock No 48; ¾ furlongs away. 138 Drayton Avenue, Stratford-upon-Avon, CV37 9LD — 1432 yards to the southeast. Unit C, 37 Timothy’s Bridge Road, Stratford-upon-Avon, CV37 9NQ — 1621 yards to the southeast. Squirrel street, Stratford-upon-Avon — 1292 yards to the east. Warwick — 1470 yards to the east. Stratford-upon-Avon — 1400 yards to the south. Polkadot Nursery, The Ridgeway, Stratford-upon-Avon, CV379JL — 1123 yards to the west. 89 Trevelyan crescent, Stratford-upon-Avon, CV37 9LP — 1362 yards to the southeast. Unit 17 The Mansley Centre Timothy Bridge Road, Stratford-upon-Avon, CV37 9NQ — 1486 yards to the southeast. Stratford-upon-Avon — 1392 yards to the south. Bishopton, Stratford-upon-Avon, CV37 9QZ — 172 yards to the southeast. 17 Toll Gate Close, Stratford-upon-Avon, CV37 9JY — 1375 yards to the south. 192 Masons Road, Stratford-upon-Avon, CV37 9LQ — 1567 yards to the southeast. Cadle Pool Farm, Stratford-upon-Avon, CV37 9RE — 1176 yards to the east. Apex House, Timothy's Bridge Road, Stratford-upon-Avon, CV37 9BF — 1486 yards to the southeast. 46 Cygnet Court, Stratford-upon-Avon, CV37 9NW — 1226 yards to the southeast. 64-66 Cygnet Court, Timothy's Bridge Road, Stratford-upon-Avon, CV37 9NW — 1486 yards to the southeast. Birmingham — 1449 yards to the northeast. Wildmoor Spa & Health Club, Stratford-upon-Avon, CV37 9RJ — 1280 yards to the southwest. Cophams Hill Farm, Stratford-upon-Avon, CV37 9QZ — 1613 yards to the east. 8 Mill Close, Stratford-upon-Avon, B504HT — 1099 yards to the southeast. Stratford-upon-Avon, CV37 0 — 950 yards to the east. Stratford-upon-Avon — 1486 yards to the southeast. Wilmcote — 1119 yards to the northwest. Cophams Hill Farm Bishopton, Stratford-upon-Avon, CV37 9QZ — 1185 yards to the east. Mount Pleasant Farm, Ullenhall, Stratford-upon-Avon, B95 5NG — 1632 yards to the southeast. M J Tech Ltd, A Cadle Pool farm, Stratford-upon-Avon, CV37 9RE — 537 yards to the southwest. 29 Timothys Bridge Road, Stratford on Avon, CV37 9NQ — 1624 yards to the southeast. Birmingham Road, Stratford-upon-Avon, CV37 0RN — 1426 yards to the northeast. Unit 2A Langley farm, Stratford-upon-Avon, CV37 0RN — 1417 yards to the northeast. Unit 27 Mansley Business centre Timothy’s Bridge Road, Stratford-upon-Avon, CV37 9NQ — 1621 yards to the southeast. Stratford-upon-Avon — 620 yards to the south. 40 Cygnet Court, Timothy's Bridge Road, Stratford-upon-Avon, CV37 9NW — 1486 yards to the southeast.